This is Book Two in the Legends of Orkney series. Sam Baron is imprisoned by the Volgrim Witches and their leader Catriona. Sam is half (Norse) god, half witch but his powers are just starting to be revealed to him and he is concerned that he can not control the powers and he may destroy what is important to him. The Volgrim Witches control him and they are using him in their attempt to destroy Orkney. Sam will need the help of his friends, Keely, Howie, and Leo to save Orkney from the witches – and himself. All-father Odin has given each of them an assignment and if they can each complete their mission, Orkney just may have a chance. I had not read the first book in this series, but when I saw that this had strong ties to Norse mythology I was very excited. Interest in the Norse myths has grown significantly in the past few years thanks to a number of popular authors and books. I’ve long been a fan of the Nordic stories, in large part because of my own heritage, so I’m always pleased to see new books working with these classic stories. The book is targeted toward a teen reading audience … the same audience of Percy Jackson,or the current Harry Potter readers … which is great. But early on I was distracted by the maturity or immaturity – of the characters. “What are you doing back here?” he said, planting his hands on his hips as he glared at Mavery. “Who’s your friend?” He switched his glare to Keely. “I came to help my friend, Sam,” she explained. But two could play at that game, and if there was one thing Howie was good at, it was being annoying. “You’re a jerk,” he said. “You’re a jerk,” it mimicked, sitting up. “I said it second, and two is bigger than one.” It held up two spindly fingers. Howie doesn’t come across particularly well so it shouldn’t have been a surprise when he later says, “Evil quests, you say? So the blade is, like, enchanted?” But I was. Although I know it’s not a ‘fair’ statement, I had the impression that this was a self-published book. What that typically means is that it needed a stronger editing hand. There’s enough here that makes this an intriguing story, but it doesn’t come through as well as it could. Looking for a good book? 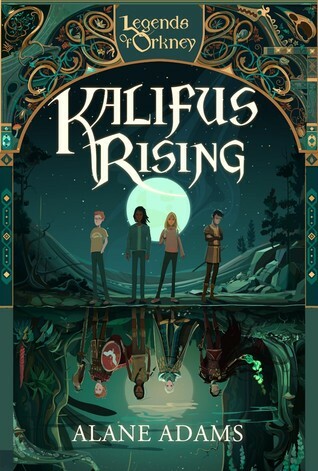 Kalifus Rising by Alana Adams is the second book in the Legends of Orkney series and shows some promise but treats the characters as a bit too immature.